Skipping it is like inviting people to your house, when you've left bags of garbage on the driveway, mounds of laundry on your sofa, and dust bunnies flying in the rooms. In other words, if you don't do this, you'll be turning off potential clients and buyers on Facebook and leaving them a bad impression of you. 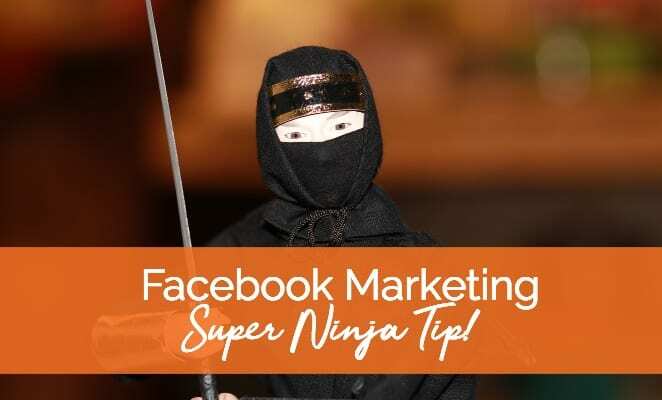 I'm talking about optimizing your Facebook listing. What do I mean by “Facebook listing” anyway? Why do you need to optimize your Facebook listing? How DO you optimize your Facebook listing? 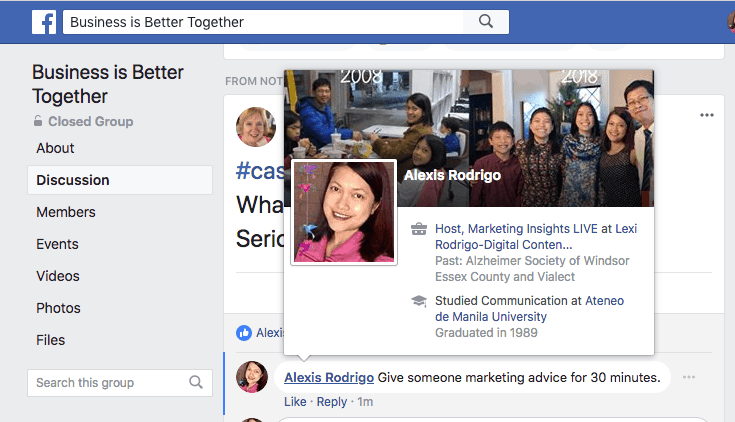 Facebook Marketing: How to Optimize Your Facebook "Listing"
What do people see on Facebook when they're checking you out in Facebook groups or in the comments of the people you're connected with? Do you know what they see? I call it your Facebook listing and that's just a term that I made up because I don't know what they call it. If you join Facebook groups and you interact with members of the group because you want to attract your ideal clients your ideal buyers, then do read this post because we'll be looking at your Facebook listing. Why you need to optimize it and how do you optimize it? 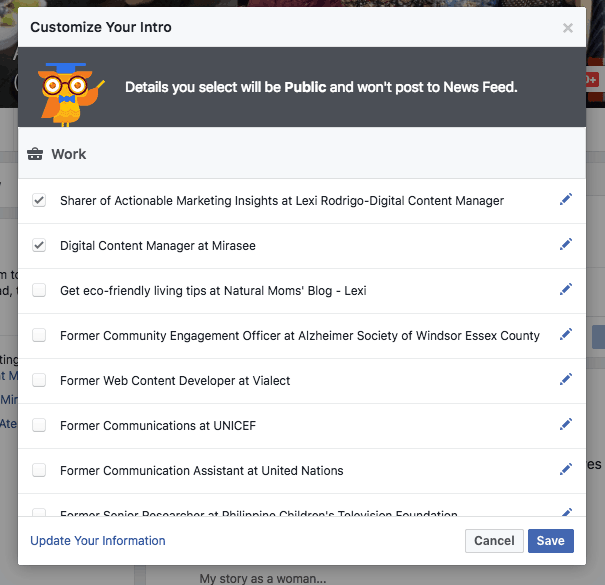 This is part 2 of marketing with Facebook lists and groups, because I realized when I was publishing the post on that topic that I had forgotten to share this very important step with you. This post is all about optimizing your Facebook listing so that when people encounter you in groups or in other people's posts, then they'll be attracted. They'll be interested in you. These are your ideal customers we're talking about, not just any random person on Facebook. Your goal is for your ideal customers to be attracted to you and to get interested enough so that they'll friend you or they'll follow you and even like your Facebook business page. If the person looking at this is not a friend of yours, then the top part here will show your mutual friends. Then it will show your your job or your employment. This pop-up box is what I'm referring to when I say "Facebook listing." We want to make sure that you optimize this pop-up box so that when someone who's not that connected with you checks you out, when they hover over your name, then they will see the information that you want them to see. For example, before I optimized my Facebook listing, what was showing up here was that I am Content Manager at Mirasee. Now that's fine, except that's not the best information I want to show people as I'm promoting my business on Facebook. I'm not selling any information products or courses yet, so that's not what I'm emphasizing right now. What I want to emphasize is the fact that I have this weekly show called Marketing Insights LIVE! and that I'm a host for it. Hopefully, the one checking me out is a person who does marketing on Facebook or anywhere online, they're a business owner or a marketing person who'll be interested because my listing says "Marketing Insights." And it say's I'm a host, so there's some kind of a credibility there. So, the job title that you want to display in your listing depends on what you're promoting. Let's say you're a book author and you want to promote your book. Then what you want to show up here is that you're an author and then the title of your book. If you sell an information product, then you can probably say "Creator of XYZ." You can be creative with this . Here's what's fun with Facebook, LinkedIn, or any platform online: You can pretty much give yourself whatever title you want, especially if you're self-employed and you own your own business. You can call yourself a CEO or a business owner or anything else. You can be creative, but you need to balance this. Don't be so creative with your job title that people find it pretentious or too overbearing. Give yourself a title that you think will be attractive and compelling to your target audience, your ideal clients, and customers. Your Facebook Cover Image: Personal, Professional, or Both? If you notice, your cover image shows up on your listing. Again, it's completely up to you what image you want to share. On my cover image, I have pictures of my family. This is because I do use Facebook not just to promote my business but also to keep in touch with my family and friends. So I choose to have my cover image be completely personal. But you can also make your cover image be about your business. There are no hard and fast rules here so we do whatever you want. How do you change your Facebook listing? 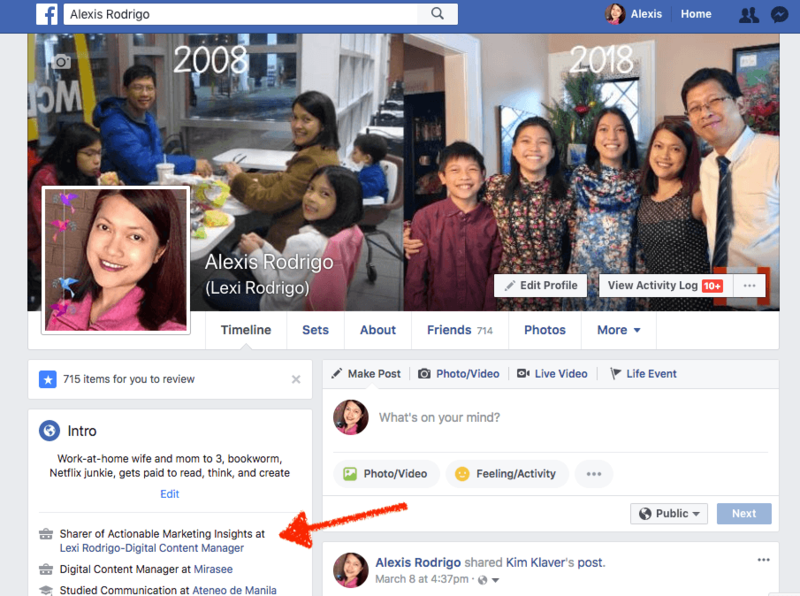 For example, when I discovered this, I found out that it was showing that I was content manager and blog editor at Mirasee, which is not what I wanted to emphasize to people who are discovering me on Facebook. How did I edit this? If you want to change what is showing up here and on your listing, then click on the pencil icon that says edit. As you can see, I've got several positions or jobs listed here but I only checked on two items (Click on the image to make it bigger). You can check on as many as you want and those will show up on your profile page. But it's not all going to show up on your listing. What shows up on your listing is your most recent position, meaning that you started in that position most recently. And so, you click on that and you may have to do a little bit of fudging the dates to get your most important position to show up. For example, if you started your own business 10 years ago and then you started a different kind of employment or a job but you don't want to emphasize your job, then you have to change the start date for your home business, if that's what you want to emphasize. That's what I I did here. 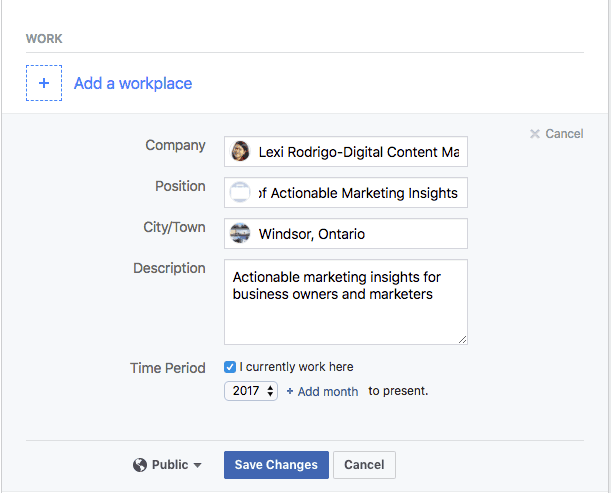 Actually, I've been a digital content manager since 2008 but I had to change my starting date to 2017 so that this job will show up in my Facebook listing instead of my Mirasee job. If you want to add something completely new, just click on "add a workplace." As I said, it can be the a real company, it can be your own company, or it can be something made up. In my case, instead of a company name, I put the name of my show, Marketing Insights LIVE. And then, again, you can give yourself any job title that you want. Just think of a job title that's going to be attractive and compelling to your ideal customers, and that gives you credibility. If "CEO" is what gives you credibility then use that. If I wanted to emphasize my copywriting business, then I can put "freelance copywriter," or "copywriter for hire," or "copywriter to CEOs and other executives." Again, be creative but make sure you're not going to be obnoxious or pretentious about your job title. And don't tell lies. Be accurate and compelling at the same time. You can also put a description here, but that's not going to show up in your listing. For time period, check "currently work here" and then pick a time period that is the most recent so that it will show up on top of your listing (Click on the image to make it bigger). Make sure that it's public so that people who are not yet your friends can still see this information. In fact, this information is for them. Then click on Save Changes and you're done! If you watch the video, you'll see how quickly the changes are reflected. Right after reading this, go ahead and edit your information and have an optimized Facebook listing right away. PS: Want to promote yourself and your products on social media without being salesy and annoying? Get a copy of my Social Media Checklist! I wanted it to be “Owner of Holistic Health Writing Services.” I’ll work on it later. Thanks again. I wanted it to show “Owner of Holistic Health Writing Services.” I’ll tweak it tonight. Thanks again and much metta.